This dish not only makes a great satiating meal for colder months, but it’s also good for transitional raw fooders. It’s half cooked, half raw, but full of flavor! 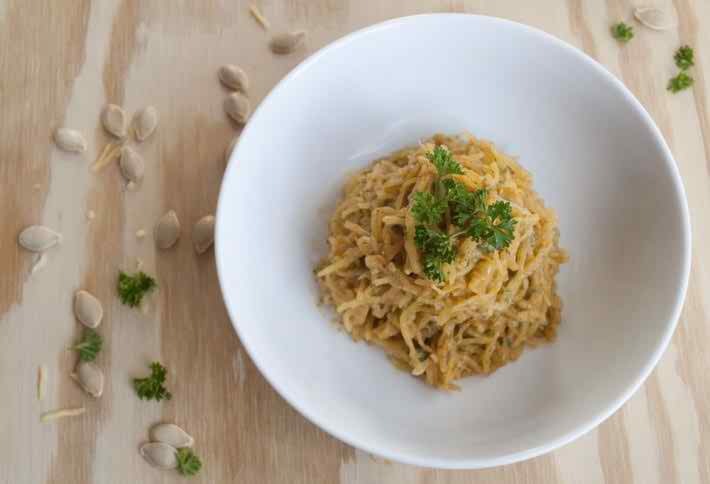 1) Cut spaghetti squash lengthwise – If you have trouble, throw the whole squash in the oven to soften it up a bit. Once squash is split in half, scoop out all seeds. 2) Bake at 350 for about 20 minutes. Keep your eye on the squash, as it may take more or less time to soften up. Once squash feels pliable, pull out of the oven. Let squash cool (or, you’ll burn your fingers like dumbzo me). 3) Taking a large spoon, scoop out the squash (which, will scoop out looking like spaghetti). If you’re unable to scoop out the squash, you’ll need to bake it a bit longer. 3) Once all squash has been scooped out, toss with dressing, olive oil, sea salt and minced parsley. * I use my homemade tahini, which I feel provides a more authentic taste than the store bought kind (however, store bought will work just fine). To make my tahini, I simply blend 1/2 black, 1/2 white sesame seeds, olive oil and sea salt until smooth. I then store it in a glass jar in the refrigerator.